Well done to both our hurling and camogie teams on reaching the finals this year. Both are undefeated so far this year and they deserve great praise for getting this far. The finals take place this Saturday, 14th June, in Trim GAA club. Our girls are in action first against Baconstown. That match is at 1.15 and the girls are asked to be there for 12.30. Our boys are then in action against St. Michael's Trim. That match kicks off at 2.15 and the boys are asked to be there for 1.30. We would hope that the girls might stay in after their finals to cheer on the boys and that the boys might arrive early to cheer on the girls! Afterwards, win, lose or draw, we are heading back to Kildalkey where the Parents' Association, along with some very kind and generous sponsors have organised food and treats for the two panels in the Village Inn. This will get going about 3.30 - thanks very much to all who have contributed to this. The very best of luck to both teams - we are very proud of you!! The Department of Education and Skills allots one teacher to each group of 28 pupils at present. This is known as the pupil-teacher ratio. The ideal situation for teacher and pupil would be a single stream class at all class levels with no more than 20 pupils per class. However, the current system does not allow for this and the principal with the advice of the school Board of Management have overall responsibility for grouping or splitting the classes where numbers would otherwise be too big or too small in one class. The Department of Education objective is that class size should be as equitable as possible across all class levels with a particular focus on smaller class sizes at infant level. The pupil-teacher ratio is dictated annually by the government budget and schools have no control over this. However, the teacher will ensure that each pupil in each class will be working on the set of skills from the national curriculum for the correct class. In Kildalkey NS, the matter is discussed in detail by the Board of Management each springtime following enrolment with a view to deciding how best to arrange the multi grade classes. $1· What if my child is worried about leaving behind her friend(s) in the other class? In most cases pupils will still mix with the same pupils at break times. Many pupils will naturally form new friendships as they get older and it is best if children can have more than just one friend. $1· Will my child be in a multi-grade class every year? As far as possible any child that has been in a multi-grade class in the current year will be prioritised for not being in a multi-grade class the following year. $1· Which teacher will deliver the curriculum/set the work/ do the corrections for my child? The teacher who is in charge of your child’s multi-grade classroom is responsible for this. $1· Is it optional to have my child in a multi-grade classroom? No. It is not optional. The principal in consultation with the Board of Management and the teachers will decide on the pupil placement using a pre-defined set of criteria e.g. Test Results/ Random etc. $1· How will the teacher be able to teach two grades effectively? Over 75% of primary schools in Ireland have multi-grade classes and this has always been the case in Kildalkey up to relatively recently. Teachers are trained to deliver the curriculum to these classes and indeed the curriculum books are usually designed to cater for multi-grade settings. $1· What happens in a sacramental class e.g. communion or confirmation? The Alive-O programme is designed to be delivered in multi-grade classrooms. On a small number of occasions, it will be necessary for the teacher to take the smaller group on their own. In many cases the remainder of the class will be involved in choir. Other teachers will assist in making sure all classes are taken care of. $1· What do I do if I feel my child is struggling/ bored in the multi-grade classroom? $1· As always you are welcome to make an appointment to address your concerns with the class teacher. Well done to the boys' hurling team and to the girls' camogie teams who have made it to the Cumann na mBunscol finals. The boys made it to the final by topping the Division 1 final. They beat Dunboyne, Athboy and then beat Trim after extra time in an absorbing encounter in Trim. The girls made it through their division by beating Boyerstown, Gaelscoil Éanna, Kilmessan and Moylagh. They then won their semi final against Boardsmill, in a keenly fought encounter. Well done to both teams and many thanks to the parents who have offered lifts constantly. The finals will be played on Saturday, 14th June in Trim GAA pitch. The girls are playing at 1.15 against Baconstown and the boys are playing at 2.15 against St. Michael's Trim. More details will follow on the games. 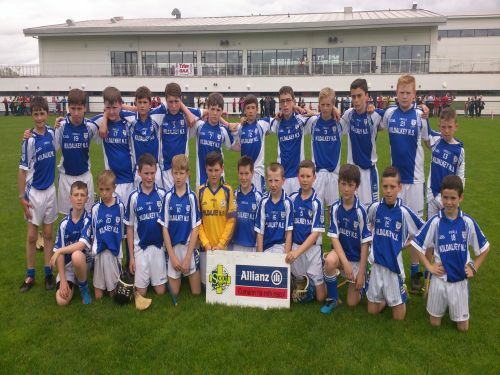 The boys' hurling team reached the semi final last week with a hard fought win over Trim. This week, the girls have the chance to emulate them by reaching their own final. Their semi final against Boardsmill will be played next Thursday, June 5th in Trim GAA pitch at 3.15. The very best of luck to them! Congratulations to Marc Shelly, former Kildalkey NS student, who today (Saturday 31st May) won the All Ireland Long Jump Under 14 championship. An incredible achievement, Marc was able to beat all of his competitors to the coveted crown. Kildalkey NS sends its congratulations to Marc and looks forward to seeing him in the Olympics in the not so distant future! !